No races this weekend as far as I know. However, a hardy seven took to Wales in search of Winter and found it while recceing the upcoming Ras yr Aran race in March. If you are unable to access the link then please take a look at the blog where we’ll offer a few snapshots of the day in the next few days. The seven out on the day were Mario, Adair, Jayne, Chris Baynham-Hughes and Ian Lancaster from Tattenhall and Karl and Wayne from Ambleside/Spectrum. Although difficult to choose optimum lines for ascent and descent on race day due to the drifts of snow and ice on route it did help to give an overview of how tough the race will be and what it entails. The Ras Yr Aran will be race two of the North Wales Series of nine. And talking of races, please don’t forget it’s the Helsby fell and road counter meeting after the club run on Wednesday night, so if you have had any thoughts on this or wish to participate then either email me your suggestions or just turn up on the night. Castle Park training still continues on Monday nights at 6.30pm so please come along and if anyone has a copy of the Welsh Fell Running Calendar for this year would they be able to bring it to training to help finalise the details of one or two of the welsh races. Abergele — our new twin town! 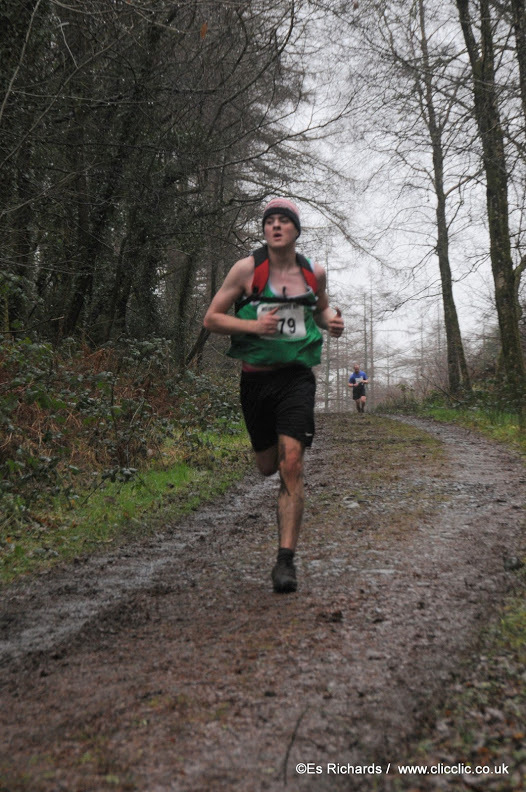 It was the 43rd Parbold Hill Race on Saturday. Please find attached a muddy report from Andy Smith below. “A warm, sunny, almost spring like day made for ideal running conditions for what would turn out to be a race of two halves. If the first half of the 6.8 mile, largely off road race was challenging enough, comprising as it did a roughly equal mix of road, track and field, including the long slog up to the cheering crowds outside the Miller and Carter pub; this was nothing compared to the copious quantities of mud laid on by the organiser’s in the second half. Not even a full season of cross country races had prepared me for the gloopy, sticky fields the race went across. Even with a new pair of studded fell shoes on, it was hard just to stay upright in many places, let alone make progress. I have no idea how those behind in ordinary trainers were coping. Mud, more mud, a couple of straw bale fences to vault / fall over, yet more mud, a muddy gully full of rocks (hidden under the mud naturally), still more mud, a stream shin deep in soft mud with a slippery bank it was almost impossible to scale, further mud. Finally we hit the last stretch of road to the finish and with a solid surface underfoot again, a chance to see whether the legs were still capable of working. A sprint for the finish and it was all over. A long queue for the hosepipe gave ample opportunity to compare notes and bragging rights with other runners as to who was the most covered in mud. An excellent run out, highly recommended for next year – it can’t get any muddier than this year. It was a great day for running at the Industrial estate, blue sky welcomed all runners which maybe helped for the fantastic results and times experienced by the majority of the Helsby runners on the day. PBtastic! There was a slight headwind on the course which surprised many runners on the course as it felt in the car park that there was barely a breeze. Great to see Joe and Mario on course in support as well as lots of familiar faces cheering the Helsby vest. Carol Shaw was the standalone prize winner on the day with a fabulous 3rd in her age category showing the consistent and great form she is in, although Carol probably had to work just as hard after the race carrying and sorting Helsby Half Marathon memorabilia. Unfortunately Alison Meakin is down as a prize winner as Tom took her place (organisors have been contacted). It’s important to change your name officially as it does other people out of genuine prizes if not! Castle Park training still on-going on Monday nights 6.30pm, will be great to see some new faces if anyone fancies it. As always, if anyone else has been participating in any other events please let me know as it is great to include them in the round up emails or on the blog. Keep up the good work and the PB’s everyone! There were various races over the weekend including Fell, XC and road with Helsby members participating in each of the disciplines. Saturday saw one of the first fell races of the season, the 6mile 2000ft Tarren Hendre, which was the first counter in the 2013 WFRA North Wales Series (sponsored by Cotswold Outdoor). There are 9 races in this series. Results and photographs are already out on the Welsh fell runners website which also states that the “weather conditions were damp and misty, resulting in a number of runners going astray. It was very wet and muddy underfoot.” Quite true! For a lot of the race runner’s visibility was reduced to about 35ft. Local knowledge of the route might have been helpful for the four Helsby runners as I’m not sure any of us took optimum lines or took the best route choice. The race started with a brisk run in a forest track to being a suddenly steep and meandering thin forest trail, quite a shock to the system but it was good to see Joe half way up the climb in support. After that there was some more fire road until another steep and slippy climb, almost like the infamous gulley of the Llangynhafal loop but with added water cascading down. The route soon opened up but there was no view along the tops, runners were lucky to see their own feet. A further climb along a fence line in tussocky grass felt like an eternity but the majority of the climb was now done. The race then changed to a slippy but fun downhill dash for a few miles, either boggy grass, or muddy barely used forest trails. Overall quite a tough workout for six miles but watching Tom looking so strong at the end was great to see. Fantastic results for Helsby too with Jayne Joy starting the season where she left off last year hitting the podiums with a 2nd place against tough opposition and less than a minute behind Adair. I’ve now stopped taking bets whether Jayne will be the fastest fell runner in Helsby in the near future. and we have the race report from Steve below. Don’t do a long one the day before if you’re a lightweight. Go to bed early and put down the wine even earlier. Eat your breakfast earlier, so it at least has time to get some way through your stomach. Don’t make the beginner’s mistake of racing hard over the second half of the second lap because you misheard something …and then have another full lap to go! You’ve done it before remember. Take the 20 points and stop whinging. See you on the start line next season, for the filth-fest that is cross country. You’d be mad not to! Race report of the Maddog 10k is gladly received from Colin Thompson who had a stunning run for a sub 38 10k! Well done to Colin on another superb run.